Today's group of Shimmers has my 3 new favorites! Nothing like saving the best for last! Also this group is more toppers. I didn't add any base colors because I wanted you to see them on their own, but I really need to go back and add some color! Pale Pink Melange Glitter Polish! There is just something so elegant about this glitter. Pink Jelly Base with Pink Rainbow Glitter Polish! Bright Royal Blue, Navy Glitter Polish! 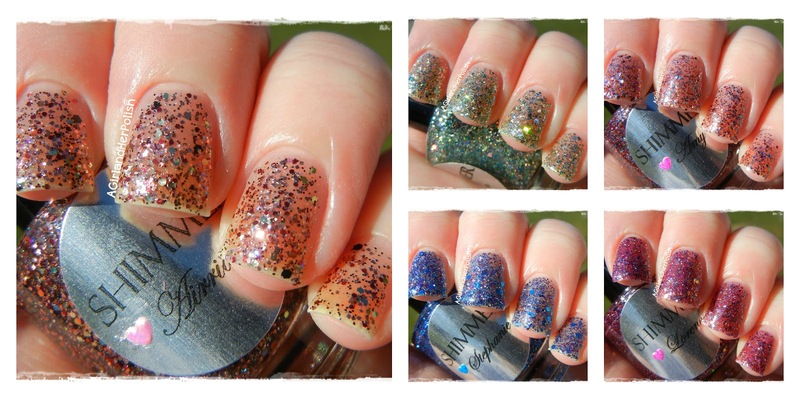 I know that the price on these glitters can be a little "wow", but they are totally worth it! I have loved every single Shimmer that I reviewed! The mixtures are amazing and there is a fabulous selection between toppers and stand alones! These beauties and more are available for purchase through the Shimmer Etsy Store. OMG!!! These nail colors are all so pretty. Love all the colors for I find them so classy and elegant. Perfect for any occasion or season. Erica is going straight to my wish list--the colours are so pretty! !